Heat exchangers with minichannel and microchannel flow passages are becoming increasingly popular because of their ability to remove large heat fluxes under single-phase and two-phase applications. 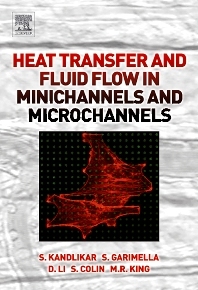 Heat Transfer and Fluid Flow in Minichannels and Microchannels serves as a sourcebook for those individuals involved in the design processes of microchannel flow passages in a heat exchanger. Researchers and graduate students working with advanced heat exchangers and cooling systems, as well as industry practitioners engaged in designing such heat exchangers in electronics cooling, fuel cell, and high flux cooling applications should find the book an indispensable tool. Satish Kandlikar has been a professor in the mechanical engineering department at Rochester Institute of Technology for the last twenty-one years. He is the founder and Chairman of the Rochester Heat Transfer Chapter of ASME and serves as Heat and History Editor of the internal journal of Heat Transfer Engineering. Srinivas Garimella is a Professor in the Woodruff School of Mechanical Engineering at the Georgia Institute of Technology. He is director of the Sustainable Thermal Systems Laboratory, which he founded upon his arrival at Georgia Tech in 2003. Dr. Garimella's research has resulted in over 100 archival journal and refereed conference publications, in addition to five patents on heat pump systems and components. Stéphane Colin is a Professor of mechanical engineering at the National Institute of Applied Sciences (INSA), in the University of Toulouse, France. In 2008, he received the Hydrotechnic Great Award from the Hydrotechnic Society of France.